The 3D Printing Days' success-story begins at Kielce's student club "WSPAK". Now the 3D Printing Days has advanced to become our part of Europe's most important meeting platform for business-insiders. Until now the 3D Printing Days expo has accompanied the "Targi Kielce's Industrial Spring"; now the 3D event has advanced to become a real highlight of the industrial exhibitions cluster. 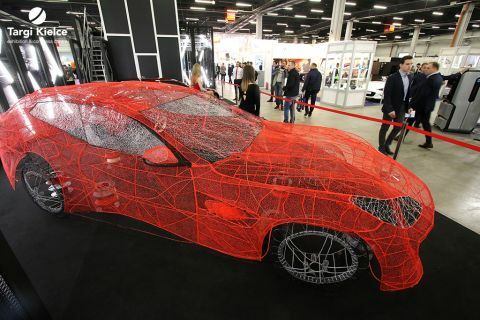 The 3D Printing Days held within the scope of Targi Kielce's Industrial Spring have confirmed its industry-standing; the expo is regarded Poland's biggest industry event of this kind. Every consecutive year the event has seen more and more companies which professionally deal with 3D printing. The previous year's exhibition used the entire expo hall; the cutting-edge 3D prototyping solutions were on display for three. The expo hosted almost 12 thousand visitors. The expo also hosts 3D scanning industry as well as rapid prototyping sector representatives. All major Polish printer manufacturers and foreign equipment distributors are also present at the event. Every consecutive edition the event has included new participants and increase its scope. The upcoming edition will certainly be unique - Poland is now launching programmes under the new European Union financial perspective. Industry, education and various business-sectors focussed on application of ground-breaking technologies will prosper for opportunities to implement new technologies. We look forward to seeing you in Targi Kielce from 10 to 12 April 2018.